Natural Gut: The favorite of all time, including the pros today. The original string, it has the best feel and is overall the most playable. It lacks only in durability. Made from part of the cow intestine and treated to have the most natural and dependable feel. 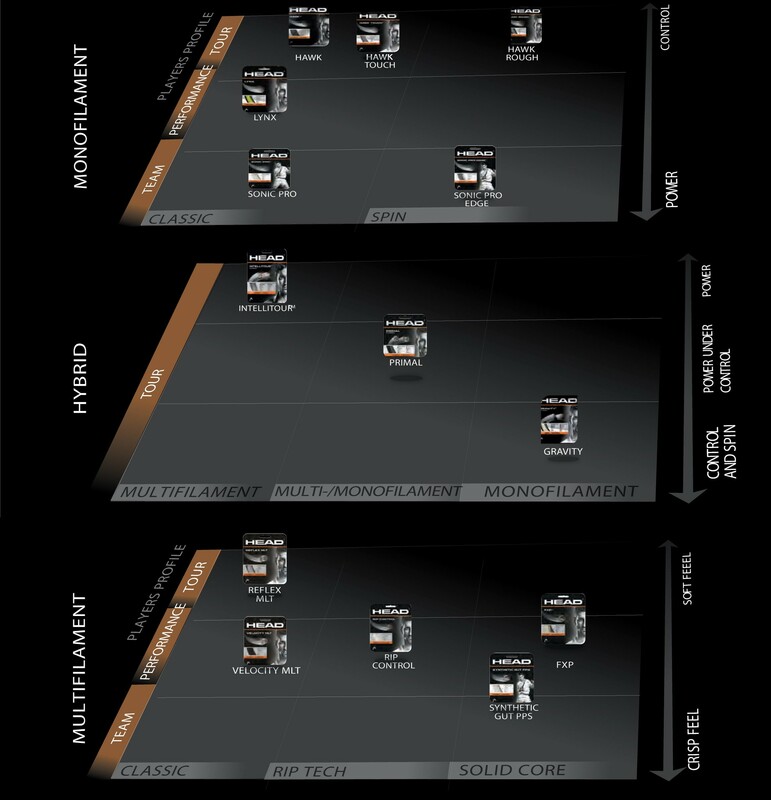 Excellent power and comfort. Polyester: Can be paired with natural gut, which is a pro favorite hybrid string job. Less comfortable but most the dependable. A solid strand (mono-filament), which is stiffer and generates less power than other strings. This is for players who take longer, fuller swings and are in no need of extra power. Multi-filament: A string of many small filaments of nylon woven together to imitate natural gut. These usually have good feel, power and comfort. Anyone with tennis elbow should look into trying multi-filaments. Great alternative for people who want some of the feel of natural gut but prefer to spend less. Synthetic Gut: A string usually made completely of nylon, consisting of filaments that wrap around a core. All-around playable but does not perform with the feel, comfort and power of natural gut. That being said, synthetic gut is much less expensive than most other strings. 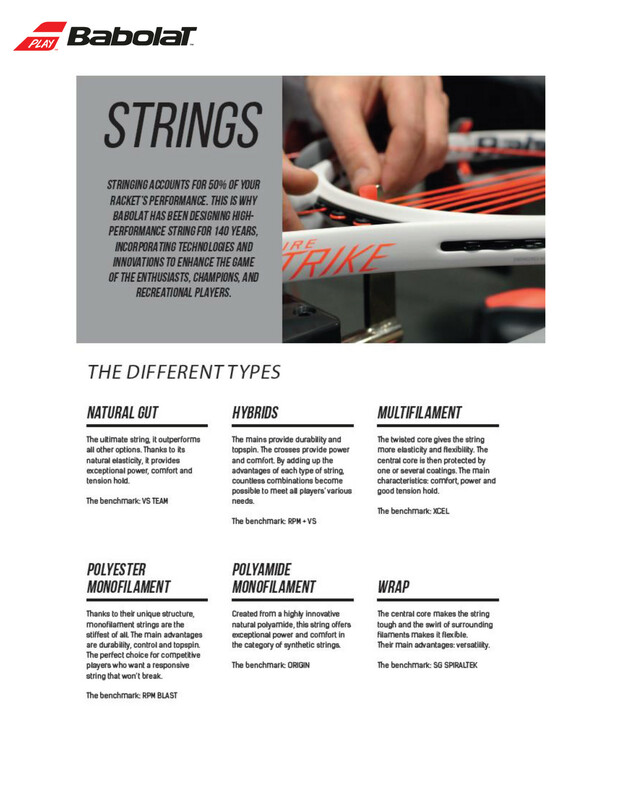 We like to recommend full bed or hybrid string jobs to our customers. Full bed (single string) is a racquet with only one kind of string. 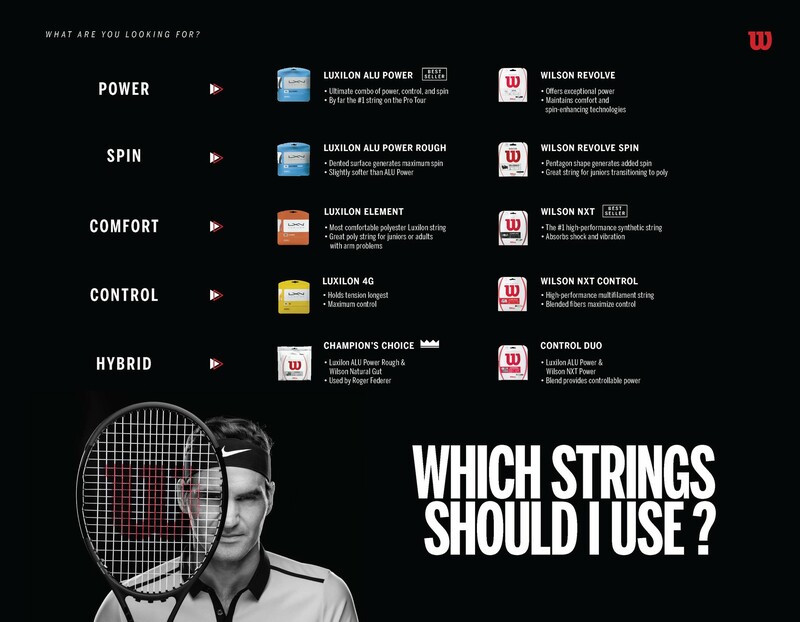 Hybrids use two different strings, one for the mains and another for the crosses. Most players who receive hybrid string jobs ask for a polyester (mono-filament) in the mains and anything else in the crosses. However, some like Federer use a natural gut (or multi-filament) in the mains and and mono-filament in the crosses. His exact setup, in case you Fed fans were wondering, is Champion's Choice by Wilson. Full beds of multi-filaments or hybrids with synthetic gut. The thinner the string the more playable, but the less durable. This is generally the accepted trade off. Ranging from 15-19, with 15 being the thickest and 19 being the thinnest. Thinner strings are expected to have more spin. However, if you are a big hitter you may break the thinner strings.